Kaffiyeh is used to refer to a large square head cloth, or a long rectangular head cloth, or neck scarf worn by men in the Arab world. The same term is used to refer to checkered red and white or black and white head cloths and to plain white ones. In Arabian societies all three colors are used: plain white, checkered red, and checkered black. On top of the kaffiyeh men place a band or circlet of twisted black cord made of silk or cotton thread known as agal (spoken Arabic for 'uqal). Headgear for men in the Arab and Islamic East is variable in form, use, and terminology. Arab men of all persuasions and faiths distinctively covered their heads long before Islam. It is safe to distinguish three broad kinds of head cover for men: traditional secular, religious (Islamic or Christian), and revolutionary or resistance. These kinds not only refer to differences in form and appearance but also in function and meaning. Historically in the region, there was as much head cover politics concerning men as concerning women. Turkey, after the fall of the Ottoman regime and the creation of a republican government, issued sartorial measures prohibiting traditional male headgear and encouraging Western hats. After the various revolutions in the Arab world in the 1950s and 1960s, particularly the 1952 Egyptian revolution led by Gamel Abdel-Nasser, the fez (tarboush) worn by men of the urban middle and upper classes, which had entered sartorial traditions with the reign of the Ottomans and remained, fell from favor. The fez became a symbol of classist, colonial interventionist messages which the antiroyal coups and revolutions were keen on removing. Many men who removed the fez went bareheaded permanently after that. In the 1970s, when the Islamic movement began, urban middle-class men and college students who had until then been wearing jeans and slacks to college and work, began to wear a gallabiyya (jellabib) and a white kaffiyeh (pronounced kufiyyah in Egyptian Arabic). This new appearance marked a revitalization of Islamic identity and a desired return to forms of appearance that were innovatively envisioned, particularly by male and female college youth in urban Egypt, as reproducing historically Islamic clothing. The movement continues to this day and has spread throughout the Arab world. The checkered kaffiyeh became internationally visible after the 1970s as a symbol of Palestine. Many people, especially students, around the world, including in Europe and the United States, showed their support for the Palestinian cause by wearing checkered kaffiyehs as neck scarves, which evoke images of Palestinian youth. The president of the Palestinian authority, Palestinian Liberation Organization (PLO), Yasir Arafat, always wears military fatigues with a checkered kaffiyeh as head cover, with a triangular fold at the center above mid-forehead. 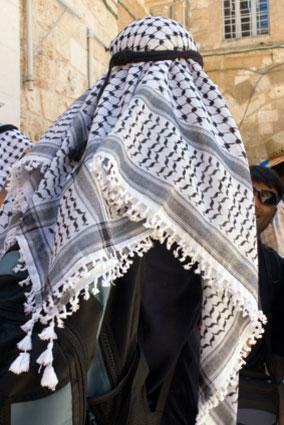 This fold is characteristic of the Palestinian style of wearing the kaffiyeh and can be seen also in Syria, Arabia, and the Gulf. The style of solid long rectangular white kaffiyeh worn flat on the head and hanging down on both sides of the head, tends to be worn by pious Muslims or those in religious leadership positions. 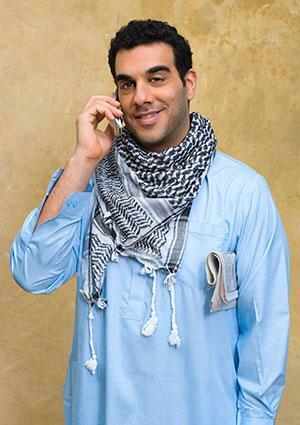 Seen throughout the Arab world, this style of wearing the kaffiyeh is understood as a symbol of commitment to religious values. The king of Jordan and his Hashemite royal men typically wear a kaffiyeh and agal. This communicates the king's identity as belonging to a long line of Hashemite bedouins indigenous to the region. Like the "veil" or women's head cover, the kaffiyeh is not a fixed or static object of clothing. It can be manipulated to cover head or face. Thus a religious man may use the white kaffiyeh worn on his head to cover part of his face, including mouth and nose, in certain situations that need a symbolic separation in space, such as gender separation. Similarly, Muslim women in India, for example, manipulate their head covers to partially cover their faces in situations in which men who are their inlaws are nearby. In the case of Muslim Indian women, manipulating the head cover to partially veil the face communicates affinal kinship distance, whereas a Muslim man manipulating a head cover to partially veil his face communicates gender separation in public space. Superficially resembling the kaffiyeh, the 'imama (turban) is another kind of male headgear worn differently and is made of a much longer piece of cloth (118 inches, or 3 meters, or longer) wrapped around on top of one's head a number of times. It is predominantly white today, but a black 'imama was worn by male members of the newly formed Islamic community in the seventh century in Arabia. This marker of male Arab identity that goes back before Islam, continues into the early 2000s. Early in the history of the Islamic community, the form of headgear distinguished Muslims from non-Muslims. While predominantly men's headgear, the 'imama was worn by some women in Egypt to the consternation of religious authorities in the thirteenth century. While conservative religious authorities disapprove of sartorial gender crossing, ethnographic evidence shows that the borderline between genders in Arab clothing styles was fluid, and more importantly, the sharing of meaning and function of head covers of both sexes was often conceptually embedded in the culture. The exact origins of the kaffiyeh are not clear. What is clear is that pious Muslims wear it as a secular head cover for marking Arab identity, as a symbol of nationalistic or revolutionary struggle, and as religious headgear. See also Djellaba; Hijab; Jilbab; Turban; Veils. Young, William C. The Rashaayda Bedouin: Arab Pastoralists of Eastern Sudan. Case Studies in Cultural Anthropology. Fort Worth, Tex. : Harcourt Brace College Publishers, 1996.